Here is a Tiger Bark fig that I recently acquired from Mii who was selling his collection. Apparently it was imported from Japan into Melbourne in the 1980's and then sold to Mii around 1999. The first owner is deceased so the history is a bit hazy. It instantly appealed to me because of its natural appearance and character and I am really looking forward to further refining it. It hasn't been repotted for a few years so I will be getting it into some fresh medium soon and adjusting the planting angle at the same time. Unfortunately there are some substantial wire marks on several branches. So, what would you do? Ideas, virts and explinations are encouraged. no worries about the wire marks on the Fig. It just means it is a true "tiger" as it has stripes. Love to see it in the flesh. Probably remove the one aberrant root to start with or pull it in to become part of the trunk. Hello to you Steven nice buy. However I agree with Grant on that root or arial, but I would dish the whole branch. Looking at side B the tree looks better in a more upright postion. So if you do loose the first branch and stood it up, in my opinion you would improve the tree. Giving it a more overal apperance of a large canopy type Ficus. taking the top half of trees of since 2005! I finally got around to starting work on this one. It's health had improved greatly since I got it but was in desperate need of a repot and haircut. On new years eve I bare rooted and hosed off all remnants of the solid mess that used to be potting medium. About 90% of the roots were removed and it was potted into a mix of Diatomite, Zeolite and coco fiber. The stray aerial root was also removed. I gave it a slight trim just so I could see the structure a bit better and it is now sitting in full sun (rain at the moment) and will be totally wired in the near future. It looks a bit funny as it is because the direction it's moving is wrong and the apex is way too high. What are your thoughts on future styling? Very nice aquisition Steven. I love the new pot and angle. Looks better with the stray root gone. I am too much of a newbie to give you advise on future styling, however the apex looks a little high for me. If it were not for my trees, maybe I could see the forest. I would bring the right hand branch down a little I think. I really like this tree but haven't really done anything with it since it was repotted over 18 months ago. The odd stray branch had been cut off but that's about it. I took it along to the Tops Weekend put on by Illawarra Bonsai Society and did a workshop on it with Robert Steven. 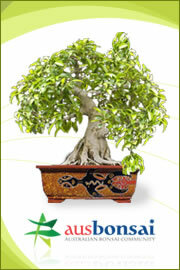 Robert commented that it was great ficus material and the age shown in the trunk is highly valued. He loved the powerful first branch but really disliked the fact that it had been styled with one single trunk-line up to the apex. 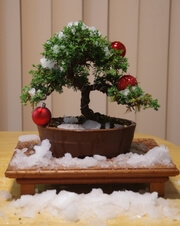 He was passionate that this should be avoided with all tropical/deciduous bonsai at all cost. Here is how it was looking last week. Robert's first instruction was to study the tree and decide on the best viewing angle. I had 2 possibilities and Robert helped me decide on one but changed it by tilting the tree. First step was to repot and re-position then start cutting... and cutting. The new structure is now there and when it shoots I'll select branches then cut back the existing ones further. The plan is to make up one overall silhouette from all the individual foliage pads while leaving open spaces between 'for the birds to fly'. The top of the tree is to be constructed from multiple branches like a mature ficus. The overall height will be not much higher than it is now. Just got emailed this photo of me with Robert after the workshop. Thanks Boris! It's been a bit over 2 years since the workshop and restyle of this Tiger Bark. Do you think the first branch should be extended further? Yes! This tree is all about the first branch, this is what makes it special. I applaud your decision to leave the aerial roots on. Not only do they look 'natural' on a fig but, as can be now clearly seen, they form part of the base of this tree. Also, that magnificent lowest branch that gives this tree its character would not be as impressive it it was denied these roots to support its growth. I suspect that as this lowest branch continues to develop and lengthen this tree will reduce in height and increase in spread - just as some figs do in nature. It did look a bit 'sad' after Robert Steven had finished with it but the end result is testimony to his work and yours. 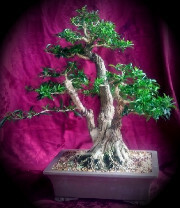 I attended the Universal Penjing Conference at the NBPCA yesterday and workshopped this ficus with Fan Shunli.